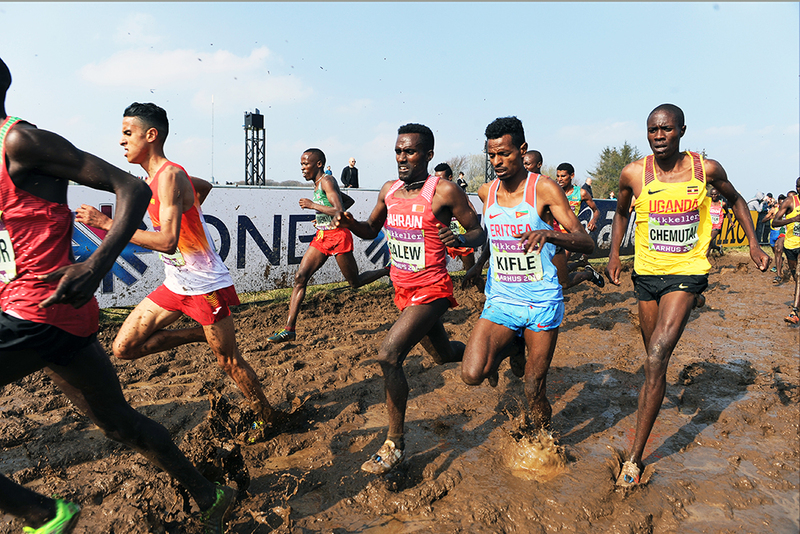 AARHUS, DENMARK, March 30—More than the monumental duals waged on it, the most discussed aspect of the World Cross Country Championships was the epic course the world’s best runners battled over. Sited on the grounds of Moesgaard Museum just south of Denmark’s second largest city, the course made use of the hilly terrain surrounding the museum, then added some artificial obstacles and capped off the challenge with a run up the museum’s grass-covered roof. The route’s roughly 2000m loop opened with a 400m uphill that climbed some 70 feet, before running through the middle of the Runner’s Valhalla—a huge beer tent featuring the meet’s title sponsor Mikkeller. After a brief downhill, the course climbed again to the Club Tent Zone before a long downhill into the first obstacle, the Water Pit: a 20m (c65ft) long water-filled trough. Following the wet obstacle, the course climbed again, then ran through the Mud Pit—30m (c100ft) of muddy terrain the organizers kept adding water to over the course of the competition—then through the Sand Pit—20m of sand—before heading downhill into the Viking Gauntlet. Yes, there were actors dressed as Vikings thumping their shields each lap while the competitors ran past. Finally the course’s pièce de résistance: The Roof! After passing through the gauntlet, the runners climbed 120m (c130y) up the museum’s grass-covered roof, which pitched up at a daunting 10% grade, before sprinting back down the same roof into The Berm—a sloped earthen embankment designed to allow the athletes to make a U-turn and either rejoin the loop or turn into the downhill finish. The first group of competitors to test the course were the Mixed Relay—2 men and 2 women per nation each racing one loop. Ethiopia and Kenya battled through the first three legs, with the traditional East Arican rivals together through the third exchange before Ethiopia’s Fantu Worku pulled away decisively to win in 25:49. Morocco (26:22) passed Kenya (26.29) for the silver, while Team USA (Kirubel Erassa, Shannon Osika, Jordan Mann, Eleanor Fulton) finished 4th in 27:01. Next up were the Junior (U20) women, with Kenya’s Beatrice Chebet narrowly awarded the win over Ethiopia’s Alemitu Takiru and Tsigie Gebreselama. All three were timed in 20:50. NC State frosh Savannah Shaw led the US contingent with her 23:29 for 53rd, with Team USA finishing 14th behind Ethiopia’s team gold. Ethiopia’s Milkesa Mengesha (23:52) edged away from countryman Tadese Worku (23:52) in the Junior men’s race. Wisconsin frosh Shuaib Aljabaly (26:18) was the top American finisher in 29th, leading his team to 6th. 5. Uganda 27:35; 6. Spain 27:47; 7. Canada 27:57; 8. Denmark 28:47; 9. Tanzania 28:48);… dq—China. Teams: 1. Ethiopia 18; 2. Uganda 32; 3. Kenya 34; 4. Morocco 144; 5. South Africa 150; 6. United States 154; 7. Japan 154; 8. Great Britain 174; 9. Australia 187; 10. France 190. … 29. Shuaib Aljabaly (US) 26:18;… 39. Meikael Beaudoin Rousseau (US) 26:35;… 55. Charlie Perry (US) 27:07;… 72. Gabriel Mudel (US) 27:40;… 75. Ibrahim Kedir (US) 27:44;… 86. Khalid Hussein (US) 28:15. Teams: 1. Ethiopia 17; 2. Kenya 26; 3. Japan 72; 4. Uganda 73; 5. South Africa 132; 6. Canada 138; 7. Great Britain 153; 8. Australia 168; 9. Morocco 195; 10. France 210;… 14. United States 257.